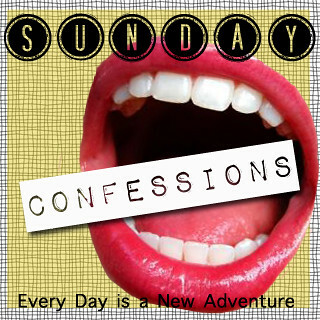 i'm linking up with alyx for some sunday confessions! 1. i sleep with a night light. i'm sort of terrified of the dark and have a hard time sleeping if there isn't a little light somewhere in the room. this week, a storm killed my night light. but instead of acting like a grown up and facing my fears, i had my mac next to me playing bon iver. and every time the screen went black, i touched the mouse pad to light it up again... this went on for about an hour. pitiful, i know. ...and it's not like i was alone. peter and luna were both sleeping nearby. 2. i'm getting so desperate for traveling/moving money, that lately i've been wondering why i quit the pub where i made enough in 2 days to cover rent for a whole month. and then i remember all of this. 3. anytime i like something, i make sure to play/eat/do/watch it more than any normal person ever should. my latest obsession is this video. i secretly wish i was either one of these girls because they're way cooler than i was at that age (am now?). 4. never have i ever read the great gatsby. and i have a bachelor's degree in english. blasphemous, isn't it? well every teacher/professor i had avoided it because they assumed everyone else had already assigned it. but don't worry, i'm finally getting to it. In "books", "guilty", "music", "sunday confessions"
three more mornings and my days as an undergrad will be over. i don't count this morning since i didn't awake in it. a bittersweet blend of stress and excitement has been keeping me from sleep. with every single thing about this video. every damn thing. this will forever be my favorite vocal recording of the song. In "music video", "music", "young the giant"
...of asking amber if we were allowed to get a blood refund. i haven't felt the same without that pint. ...of skipping kickboxing class last night and pretending like it was doctor's orders, although the blood bus people only told me not to work out tuesday. ...of eating half a box of milano cookies in one sitting while watching eleven-year-old kirstin dunst kiss brad pitt. life is so unfair sometimes. ...of making fun of luna's haircut yesterday. i laughed out loud in class when amber texted this to me. ...of skipping three too many classes this week. and not feeling guilty as i cuddled in bed instead. ...of opting not to write papers when i got home from school, and instead going out on a dinner date with sarah... which then turned into a 3 hour intellectual convo/life advice sesh. ...of watching the graduate for the very first time last night and absolutely LOVING every minute of it. ...of also watching SEVEN marilyn monroe films in the past two months. i had to watch some like it hot for film class, and now i'm sort of hooked. it's hard to stop when most of her films are on netflix. ...of buying red lipstick and wishing i could pull it off like all of those beautiful hollywood actresses. ...of refusing to watch my week with marilyn because i just don't see that spark in michelle williams. ...of replaying this song 7 thousand times last week. and loving it every time. In "beer", "blood", "gotye", "guilty", "list", "luna", "marilyn monroe", "movies", "music"
tell me something real, tell me something true. if it weren't so pretty outside lately, i would try to hide in my room for as long as i could get away with. the amount of things plaguing my mind recently is absurd. the 6 classes, 3 days of work a week, projects, and workout routine that i am juggling is just about to topple and knock me to the ground. i have three papers, a project, and a discussion post all due tomorrow. just tomorrow. i can't even start on the hundred other things weighing down my to-do list. and that's the problem. the weight of all these things i'm juggling is preventing me from mentally being able to stop and focus on just one. i blame my popcorn brain - my shortening attention span that's developed thanks to the thirty tabs on my browser, all blinking with ads. i have to keep reminding myself that i'm almost done. graduation is quickly approaching. sigh. but my head is in the stars and my feet are in the sky. well i'm nobody's baby, i'm everybody's girl. i'm the queen of nothing. i'm the king of the world. i don't think a song exists that i relate to more closely than this one. i've had it on repeat because it brings my spirits up when i'm stressed. plus these black and white movie clips are fabulous. In "college", "flowers", "lyrics", "music", "stress"
i stumbled upon this little album a few weeks ago. then i sort of became obsessed.